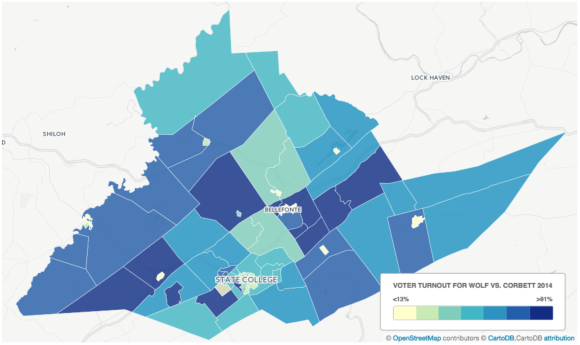 Map of 2014 Pennsylvania Governor’s race election turnout in Centre County created by Aaron Dennis for his presentation on “Mapping State College Election Results” at the January meet-up. Next State College Maptime meet-up is February 24. The Jennifer Fluri and Amy Trauger Student Essay and Creative Works Competition, sponsored by SWIG, is now accepting submissions. Due date: March 20, 2016. The reintroduction of mammalian predators often has been met with controversy among citizens near reintroduction sites primarily because of concern for predation of domestic animals and game species (species popular for recreational hunting). The North American river otter (Lontra canadensis) is an example of a predator widely reintroduced in the United States that has in some cases been negatively depicted in the media because of its predatory habits (i.e., fish eating). Two geography students have started a Maptime chapter in State College to support community cartography and teach people how to use and create maps. The endeavor is co-sponsored by The Peter R. Gould Center for Geography Education and Outreach in Penn State’s Department of Geography. Cynthia A. Brewer, head of Penn State’s Department of Geography, has released a new edition of “Designing Better Maps: A Guide for GIS Users.” Published by Esri Press, the book guides mapmakers through the process of designing visually pleasing and easily understandable maps. Native generalist herbivores might limit plant invasion by consuming invading plants or enhance plant invasion by selectively avoiding them. The role of herbivores in plant invasion has been investigated in relation to plant native/introduced status, however, a knowledge gap exists about whether food selection occurs according to native/introduced status or to species. We tested preference of the native herbivore white-tailed deer (Odocoileus virginianus) for widespread and frequently occurring invasive introduced and native plants in the northeastern United States. Increasingly, objectives for forests with moderate- or mixed-severity fire regimes are to restore successionally diverse landscapes that are resistant and resilient to current and future stressors. Maintaining native species and characteristic processes requires this successional diversity, but methods to achieve it are poorly explained in the literature. In the Inland Pacific US, large, old, early seral trees were a key historical feature of many young and old forest successional patches, especially where fires frequently occurred. 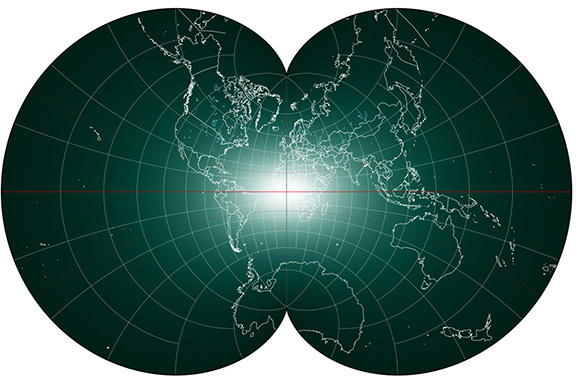 The Eisenlohr world map projection. A green gradient is used to represent the amount of areal distortion across the projection’s surface. The darker the green on the color scale indicates more areal distortion. See related story below. E-K Kim will be co-chairing a workshop on “Rethinking of ABCs: Agent-Based Models and Complexity Science in the age of Big Data, CyberGIS, and Sensor Networks” at The GIScience 2016 Workshop, ” in September in Montreal, Canada. More information is available at: http://sites.psu.edu/BigComplexityGISci. The no)Boundaries student conference is on February 20 on the first floor of Deike Building. Neighborhood poverty has long been viewed as an important predictor of children’s exposures to violence and victimization. A growing body of evidence from ecological studies indicates that crime and violence are affected not just by a neighborhood’s poverty level but also the poverty level in nearby areas. However, such evidence has not been systematically integrated in the neighborhood effects and victimization literature, where neighborhoods remain assumed to predominantly function as isolated islands having no interaction with surrounding areas. 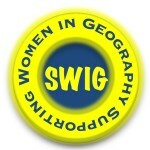 Enhancing geographic literacy: All maps distort, so which ones should we use? Fritz Kessler, a senior research associate in Penn State’s Department of Geography, was awarded a Gladys Snyder Education Grant from the College of Earth and Mineral Sciences (EMS) to support his project “Map Projection Use in World Atlases (1850-2000): Rise of the Pseudocylindricals,” which examines the history of map publishing. “When you create a map, you use mathematical processes to project Earth’s spherical surface onto a flat surface. We know that all maps are distorted representations of Earth,” Kessler said. 11:30 p.m. IST—Urging my auto-rickshaw driver to move faster, I manage to arrive at my research site in the Malad suburb of Mumbai, in time to observe the change in shift of call center workers. This area of the city is lit up, as work hours are in full swing in call centers. There are numerous private buses and taxis lined up outside these call centers. These provide transportation for call center employees working the night shift, as mandated by Indian law. Each bus has a sign labeled with the name of the company and the neighborhood that is its final destination. As I stand watching, busloads of employees working for British companies, and according to UK shift times, head out. Shortly thereafter, buses and taxis with employees working for U.S. companies, and in U.S. daytime hours, arrive. This duration of bustling activity quiets, and I can observe more closely the numerous street vendors who line the streets on either side outside call centers. This story originally appeared in the October 2015 issue of Research|Penn State magazine. Last week’s feline was Pike, companion to Liz and John Dzwonczyk. Send a photo of your animal companion to geography@psu.edu. 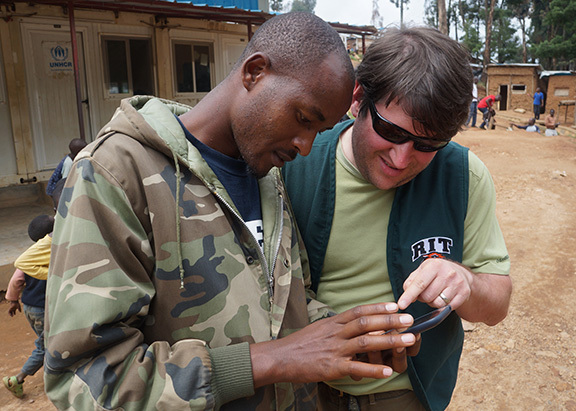 Brian Tomaszewski, (Ph.D. ’08) teaching Frank Gasiriba Mbyirukira how to use smart phone-enabled mapping tools. Mbyirukira is a Congolese refugee living in the Kigeme refugee camp in Rwanda. Tomaszewski recently created and led a study abroad trip that nine Rochester Institute of Technology (RIT) students participated in. The RIT students worked with United Nations High Commission for Refugees (UNHCR) to map the Kigeme refugee camp. A key component of the trip was educational outreach back to Congolese refugees to teach them mapping skills for improving their lives. Britt Eckerstrom (B.S. ’15) was drafted to the Western New York Flash of the National Women’s Soccer League (NWSL). Sara Cavallo’s book review of Forest Prairie Edge: Place History in Saskatchewan was published in the most recent issue of Rural Sociology. Jennifer Mason has had two papers accepted for publication. One in Cartography and Geographic Information Science and the other in a special issue of Spatial Cognition and Computation: An Interdisciplinary Journal. Brian Swedberg (M.S. ’15) was presented with an Army Commendation Medal for Valor for his actions during deployment to Afghanistan in 2011. Recent Coffee Hour speaker Qunying Huang and Guido Cervone have contributed a chapter on “Usage of Social Media and Cloud Computing during Natural Hazards,” in the book Cloud Computing for Ocean and Atmospheric Sciences. Emma Gaalaas Mullaney has been awarded Penn State’s Harold F. Martin Outstanding Teaching Award for 2015-2016, a highly competitive award recognizing her skill and dedication in the classroom. Justine Blanford and colleagues at the School of Epidemiology, Public Health and Preventative Medicine, University of Ottawa have published a paper on “The Sociospatial Network: Risk and the role of place in the transmission of infectious diseases” on PLOS One. Justine Blanford and Fritz Kessler received Gladys Snyder awards. Guido Cervone beat Yanan Xin, 5.3 to 6.2 seconds, at the first Geoinformatics and Earth Observation Laboratory sprint run event. Sturgeons are among the most ancient and enigmatic fishes found in our oceans, lakes, rivers, and estuaries, yet despite ongoing efforts to conserve their wild populations, most species are either threatened or endangered with extinction. Within the state of Georgia, for example, three of the four native species are Federally listed under the ESA, while the fourth was only recently reintroduced after being extirpated for nearly 30 years. Southwestern Pennsylvania Commission (SPC) is the official Metropolitan Planning Organization (MPO) for the ten-county region including the City of Pittsburgh, and the counties of Allegheny, Armstrong, Beaver, Butler, Fayette, Greene, Indiana, Lawrence, Washington, and Westmoreland. SPC is seeking summer interns (May-August) to complete work in the Local Asset Management Project and Traffic Count Monitoring Program (HPMS), Multimodal Planning Group, Freight Planning Group, and Transportation Operations and Safety Group. Local Asset Management and Traffic Count: Outdoor data collection throughout the 10-county Southwestern PA region, including information on local roadways, bridges, traffic signals, and other transportation assets. Multimodal Planning: Assist with data collection and field observations, analysis and presentation of information for use in development of a regional Active Transportation Plan. Freight Planning: Outdoor data collection throughout the 10-county Southwestern PA region, including information on local roadways, bridges and other transportation assets. Traffic Signal / Safety Operations: Field work associated with our Regional Traffic Signal Program. Alumni Evan Klauda (B.S. ’11) and Andrew Homka (B.S. ’15), from TerraSim, will be at the career fair on Wednesday, Feb 10 at booth B-13. TerraSim is looking for candidates for summer internship GIS positions. Stop by their booth for information about the positions and company. The Commission on Lesbian, Gay, Bisexual, and Transgender Equity (CLGBTE), the Commission on Racial/Ethnic Diversity (CORED), and the Commission for Women (CFW) are now accepting applications for both appointed and affiliate membership. Appointed members serve three- to four-year terms (depending on the commission) and have voting privileges. Affiliate members serve one-year, renewable terms and do not have voting privileges. Appointed and affiliate terms begin on July 1, 2016. To learn more about the Commissions, and to submit an online application, please visit: http://equity.psu.edu/pce The application deadline is Monday, February 29, 2016. The previous animal was Kiki, companion to Azita Ranjbar and Morteza Karimzadeh. The first person to purrfectly identify the grimalkin was Liz Dzwonczyk. Who is this feline? Who are her humans? Send your guess and/or a photo of your animal companion with catitude to geography@psu.edu. Don’t procatstinate.